A recent video shows exactly why tigers don't belong in the circus. 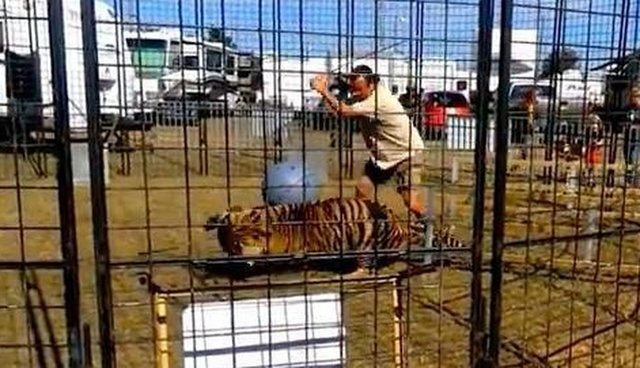 Earlier this week, a trainer was working with a tiger at Florida's Pensacola Interstate Fair when everything went wrong. A tiger began to nudge at a trainer's leg, causing her to lose her balance, and in a second the animal was on top of her. In a clip taken by one of the audience members, the tiger can be seen trying to mouth at her legs while the trainer hits him in the face and tells him to back down. Another male trainer enters the ring, and lifts his arm to whip the tiger. When the tiger, a 2-year-old adolescent named Ghandi, sees the whip coming, he grabs the female trainer by her leg and drags her across the enclosure as she cries out for help. The male follows the pair, beating the tiger relentlessly. A group of children - who were visiting the show on a field trip - can be seen in the foreground looking shocked. An adult can be heard telling them to look away. Fortunately the woman, Vicenta Pages, a former Ringling Bros. and Barnum & Bailey Circus trainer, escaped without severe injuries - a lucky break considering tiger attacks are often fatal. "He dragged her around the ring and she's lucky he didn't fatally wound her," Susan Bass, PR director for Florida's Big Cat Rescue (BCR), told The Dodo. "That she was even able to stand up is amazing." But while the video is difficult to watch out of concern for the trainer, it's also highly unsettling to witness the tiger being beaten so severely -and now people are calling on the circus to be held responsible for putting a wild animal in a position where such an accident could even happen. "In the words of Chris Rock, 'That tiger didn't go crazy, that tiger went tiger,'" Rachel Matthews, associate director of captive animal law enforcement for PETA, told The Dodo. "It's never a surprise when a wild animal behaves like that." Bass echoed Matthews' sentiment, explaining that Ghandi "was just being a tiger." While trainers often claim their animals are "tame," Bass added, it's just not possible to override a tiger or lion's wild instincts. She cited a video BCR produced a few years ago that shows tigers and other big cats at the sanctuary - many of whom were raised by humans before being rescued - lunging at sanctuary workers (from behind the safety of their enclosure walls) as soon as their backs are turned. "It's as simple as turning your back," Bass said. "And in this case the woman seems to have stumbled when messing with the tiger. And as soon as she fell, he saw her in a different way, and his instincts took over, and he thought, 'Well, this is prey' ... or maybe he thought she was even playing with him. He's only a cub." Unfortunately, it's that natural instinct that makes it impossible for big cats to be trained "humanely," though many trainers claim to use only positive reinforcement. A lion or tiger at a circus simply can't be controlled unless they're beaten or frightened into submission, Bass explained. "It's not through positive reinforcement as trainers would like you to think," she noted. "Obviously ... you saw how quick the trainer was inside the cage and he was mercilessly whipping that poor cat. He obviously was trying to get the cat off the human - and human lives are very important - but the tiger should not be in that situation." "It's so telling that these trainers are always going with a whip in one hand and a goad in the other," Matthews said. "They train these animals through fear-based techniques." Virtually every performing cat show features abuse behind the scenes. And trainers often put profits before the well-being of their animals in other ways, too. Pages, the trainer who was attacked, currently runs Pages White Tiger Show, which features white tigers as its stars - a questionable premise, as white tigers display an unnatural coloring and are bred solely for circuses and other unscrupulous animal owners. They face a host of health issues from severe inbreeding - virtually every white tiger has crossed eyes, and they can suffer from other issues ranging from kidney problems to external deformities to premature death. And the mistreatment performing animals face is ongoing. A recent investigation into Ringling Bros., Pages' former employer, showed how deplorable the conditions were for tigers in between shows. They were left packed in small, barren enclosures in a parking lot, with no shelter during much of the day. They also had no enrichment or places to swim, despite being aquatic animals - trainers told the investigator that they had no time to set up enrichment, despite being camped out for nearly a week. The tigers were also observed fighting due to the overpacked quarters, with several bearing scars from fighting or injuries from lying and walking on the hard pavement instead of natural terrain. "The big cats ... are managed through fear, coercion, and punishment," Jay Pratte, an animal trainer with 25 years of experience who conducted the investigation, said in his report. "The announcers, trainers, and staff state that the animals are managed with rewards and through trust. However, what is actually occurring is environmental and physiological neglect, psychological abuse, and coercing the tigers to behave through dominance and fear-based techniques." "When the goads or whips are raised, the cats flinch and shy back every time," he added. "When animals move forward as if to strike or react, they are yelled at and either quickly struck or startled back with whip cracks in the air or on the ground nearby." And people shouldn't only be concerned about the animal's safety at such performances, Bass said. She pointed out that Pages, the trainer who was mauled in the video, has years of experience behind her. "There's never a time when you have enough training and experience that something horrible can't happen," Bass said. Those safety concerns aren't limited to trainers. At traveling shows in particular, animals are often restrained from the audience only by tethers or portable fences. In this case, Bass noted, the video shows that when the male trainer rushes into the enclosure to help his partner, he appears to leave the door unlocked behind him - meaning there was little barrier between the tigers and a crowd of children. "They could have easily escaped and mauled [someone]," she said, noting how easy it is for safety to be compromised during a crisis. "And those poor schoolchildren who saw that? That's haunting. If I was a kid I think I'd be having nightmares." 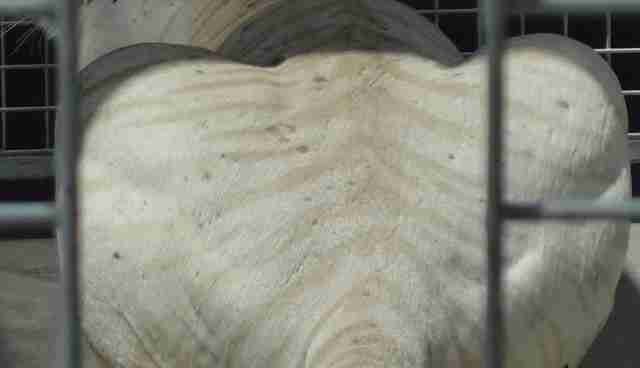 Matthews said PETA has reported Pages White Tiger Show for violations of the Animal Welfare Act, as well as to the Occupational Safety and Health Administration (OSHA) - she said OSHA is currently investigating the incident. However, as is often the case, the show owners are downplaying the incident to avoid repercussions. Before the video was released, David Donnert, Pages' fiance and the trainer who was recorded whipping the tiger, told local outlet WKRG that the tiger simply scratched Pages while playing. "It wasn't a pounce or an attack at all," he said. Pensacola State Fair officials, who did not observe the incident but were relying on an account provided by the show owners, also originally told local media outlets that Pages suffered minor scratches and wasn't bitten, and that the tiger quickly released her. Even Bekah Nelson, a spokesperson for the Florida Fish and Wildlife Conservation Commission (FFWCC), originally said that it was a minor incident and that Pages only sustained scratches. But when the video was released showing the extent of the mauling, the fair apologized, telling the Pensacola New Journal that it had spoken based on misinformation from the trainers, and that it did not condone animal mistreatment. In a later statement, the FFWCC told People that Pages was bitten and sustained "substantial injuries." Pages was taken to a hospital, where she underwent surgery for her injuries. "You don't have a tiger drag you and go to the hospital for surgery for just a scratch," Bass said, noting that circus and other big cat owners will often mislead the public about the seriousness of the attack to avoid repercussions from officials. "It happened in Florida so of course the Florida Wildlife Commission is going to be investigating it," she noted. "And the national group, the Department of Agriculture, is also going to be investigating. So they're obviously going to be downplaying it." But for now, only time will tell whether Pages and her company face consequences for the alleged welfare and safety violations - or what the future holds for Ghandi. In the meantime, Matthews is hoping that the incident will show people what life is like for these animals behind the scenes, and encourage the public to stay away from any show where lions are tigers are forced to perform. "As long as places like the Pensacola State Fair continue to hire animal shows ... attacks like this are going to continue to happen," she said. "Life in a steel cage when you're always flinching away from a whip is no life at all for a tiger." Want to help tigers like this one? You can make a donation to BCR or the Performing Animal Welfare Society, both of which provide homes to big cats rescued from entertainment, and campaign against their use in shows. You can also sign this petition asking Ringling Bros. to set an example for other circus shows by retiring its performing animals.